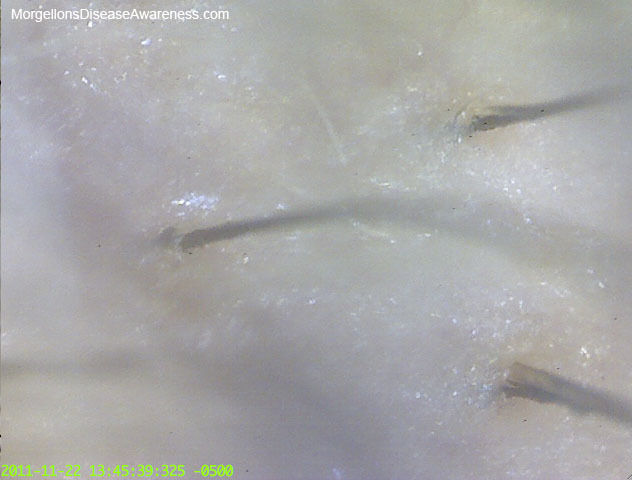 Morgellons Disease Awareness - Morgellons Disease treatment with Gordon Stamp's F6 enzymes F-6 Treatment Please note that Gordon Stamp is no longer producing the F line and unfortunately for Morgellons sufferers and Gordon, the FDA is investigating his product. I'm leaving this page up in case people are interested in my experience with it. 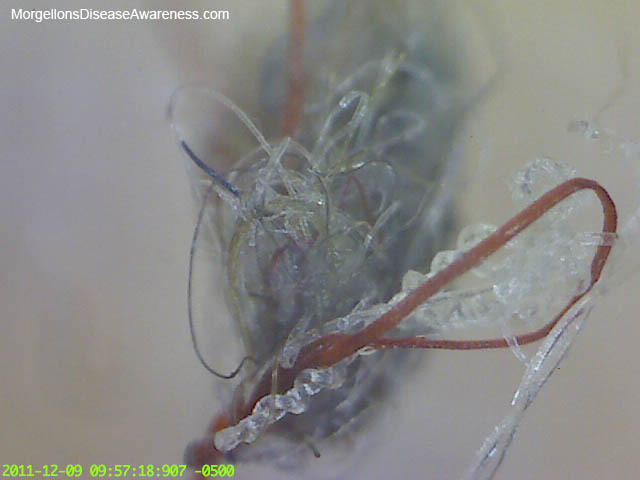 The Morgellons community stands behind Gordon for trying to help us in an hour of need—something the medical community has failed miserably to do. His dedication and determination to turn things around for himself, his family, and those who have been afflicted has been truly heartfelt. If you can lend some financial support for his legal fees, it would be greatly be appreciated. Donations can be mailed to: Gordon Stamp1960 Whitetail Ridge Court ExcelsiorMN 55331gordonstamp AT msn.com﻿ It has come to my attention that there is another enzyme product on the market. I have not used it, nor is it a replica of Gordon's F-6, but one user said she felt it helpful. I'm not sure if she takes it internally or uses on the surface of the skin. It has maltodextrin in it. ercprobioticenzymes.com﻿ Gordon Stamp, a fellow Morgellons sufferer unable to get relief by traditional means set out to study Morgellons. Five years later, he has formulated a product called F-6 Restore that seems to be helping people. It's an organic enzyme product applied directly to the skin. I'm documenting my experience with it here. Please note: at the time I created this diary Gordon was sellling F-6. Over time he has adjusted the formula and so his newer products have a different name. It might be best if you are considering ordering some, to give him a call and discuss what might be best for you. I do not recieve compensation for reviewing or linking Gordon's product. Oct. 16, 2011 Product arrived today. Powder needs to be added to water. Small convenient spray bottle was enclosed with it. I've tested it on small patches of the body to see how I react. Almost imperceptible burn sensation. Within seconds of rubbing the wet solution into the skin I could feel particles in a few areas sloughing off under my fingers. 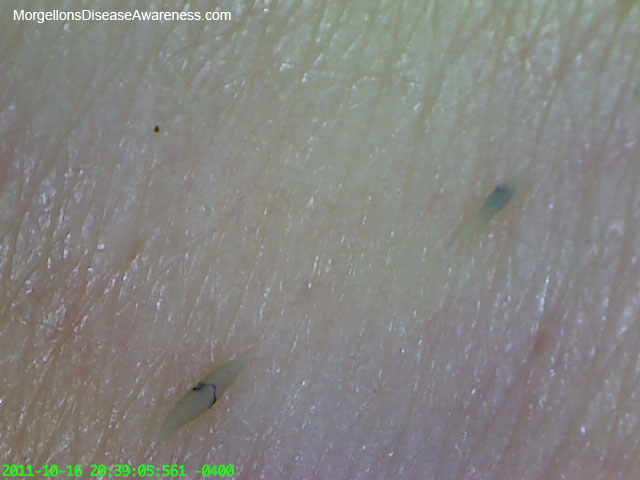 I have no idea what this is coming off the skin, but am encouraged to see fibers and tiny black particles being taken with it.Above: Two cylindrical forms balled up after rubbing the skin with product. Below: Enlargement of cylindrical form with fiber and black particle. Above and below: This rock-like particle (as large as a pinhead) emerged from the skin. Haven't seen one of these since early onset of the disease. 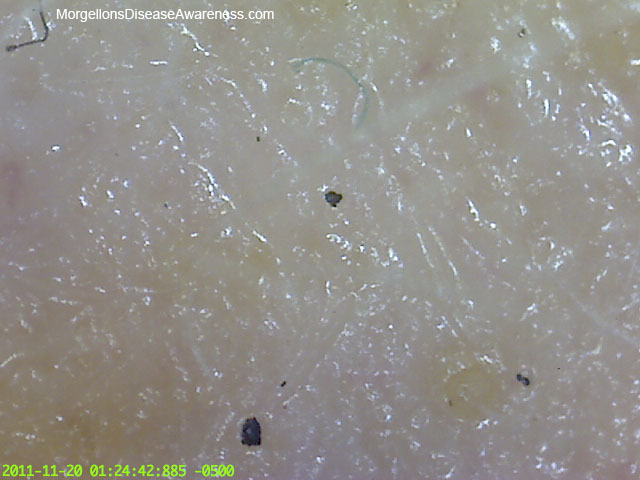 Many Morgellons sufferers have felt what seems like fiberglass cutting into their skin. You can see from these pictures how much these particles resemble glass. It is understandable that the presence of these particles under the skin would cause great discomfort.Above: I'm growing dolphins! 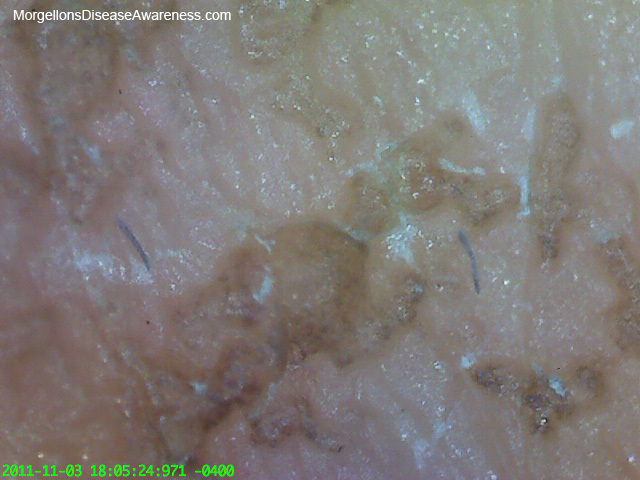 I've been expanding the use of F-6 rubbing it over larger tracks of my body, I happened to take a look at my fingers with the scope (two photos below) and was surprised to see this many fibers at one time. I've noticed since the onset of disease that fibers seem to concentrate in the hands but I've never seen quite this much activity. It appears that the F-6 is pulling them to the surface. Fibers have not appeared in all the areas sprayed with the product, but certain spots like my abdomen, are definitely "sprouting. "This morning I sprayed the F-6 over entire body excluding head and face—I'm working up to full body. Within 20 minutes of application track marks as well as fibers appeared in four different spots on my belly and abdomen. Photos below.Above: Two photos spliced together to show more fully the complete track.Above: A track breaks open.For the first time I have applied F-6 to the entire body including scalp and face. After about half an hour I noticed some "crystal" trees formed at the back of the neck. A few hours later, I went back and looked at my hair. Crystal structures proliferated on the hair shafts. I've been looking at my hair on and off in the last few weeks and wasn't seeing anything like these ice-like formations. The only time I saw anything like this cystalization was back in Dec. 2010 (see hair damage). I emailed some photos to Gordon and he believes this is the biofilm coming up. This crystalization is the same thing that 'Homeworld' has in his hair.Above and below: Seeing more "gunk" emerging from the hair shafts.Above: Hair looks like it is coated in hoarfrost. Tiny iclicle projections cling to it.Below (3 photos): Oct. 25, 2011 Since I just began using the F-6 in the hair, I'll consider the below photos as the "Before" or baseline images of my hair in its present condition. 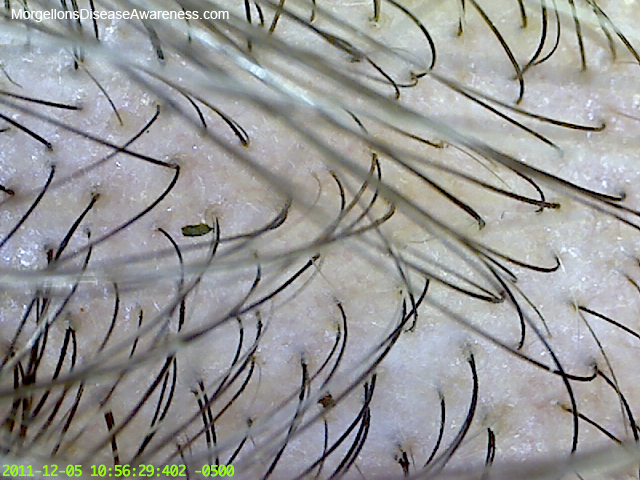 Every follicle is under attack with the surrounding skin blistering open and receding from the hair shaft. For some months the hair has been extremely fragile and falls out with little provocation.Above: Oct. 27, 2011 Noticed what looks like nodules on the chin. I thought maybe my pores just needed exfoliation. Now I'm not so sure because on the next day, they had spread to the entire face (below), so something is up. Note that the F-6 appears to be affecting them (or the area around them) in some way hopefully breaking them down.Above and 2 photos below: Oct. 30, 2011 These shots are from the face. Skin was washed in a hot shower. When dry, rubbed the F-6 in vigorously. Approx. an hour and a half later, looked at skin and saw black particles rising to the surface. Later still, I checked in again and there are a lot of fibers coming up as well. This looks like it might be a die-off reaction. 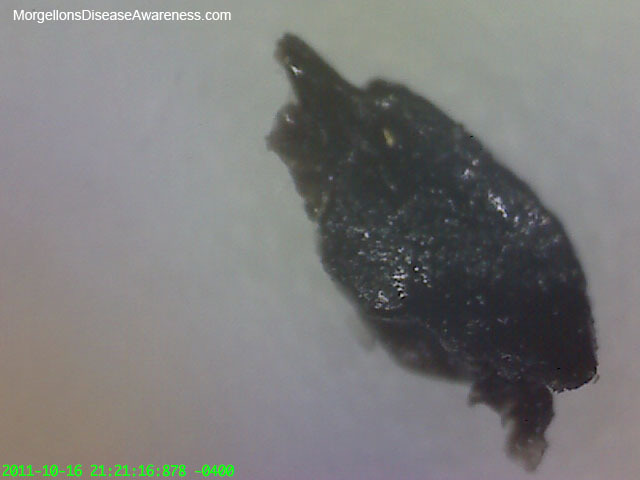 I saw a similar outpouring of black particles when I began chelating last year.Nov. 3, 2011: It's been nineteen entertaining days. It seems like something new is always cropping up. Overall, one wouldn't notice any big changes to my skin if they just looked it over, but a closer examination shows that a lot is going on.Two days this week I had a couple of pinprick lesions open on the left hand, next day a few on the right hand—maybe 8 total. These were very tiny. 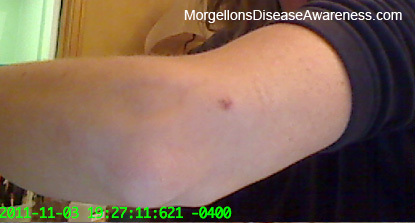 A day passed where nothing happened and today a lesion has broken through near the elbow. 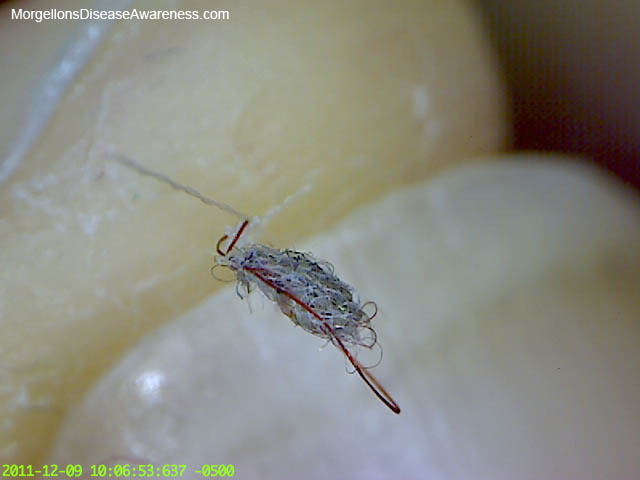 This is bigger than I've ever had.There are many more fibers coming to the surface of the skin then previously seen in the two years of dealing Morgellons. 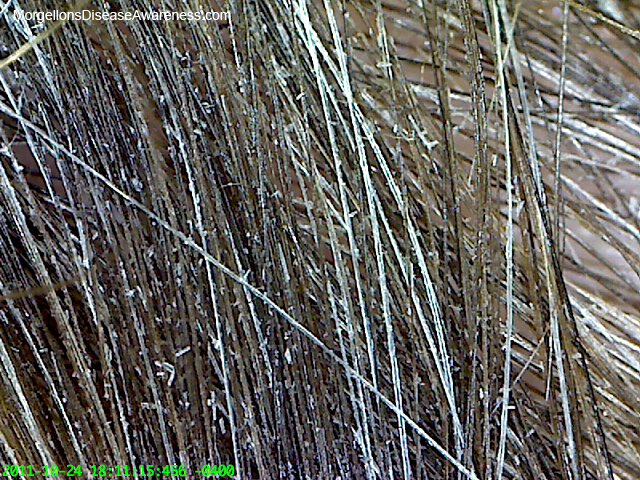 Bigger black particles similar to what one can see in the above photo are suddenly coming up in the scalp area. They sometimes look like black seaweed.Today I checked the scalp and it's looking better to me. The flaking that was present on Oct. 25, seems reduced. Scalp is smoother. 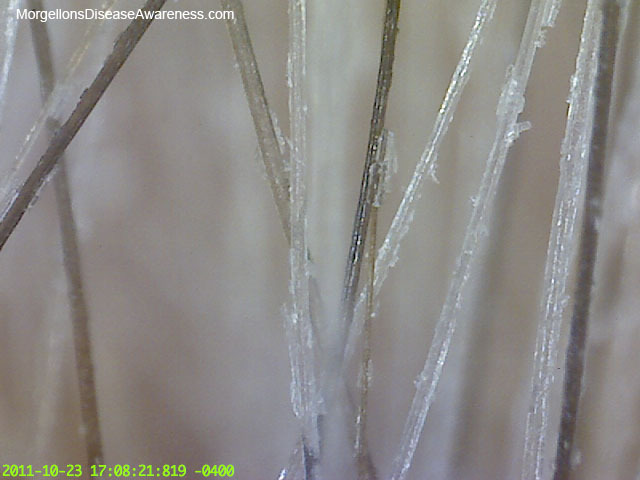 There is however, more presence of blue and red fibers, which I have rarely seen on scalp. When I clean my face with a cotton ball soaked with alcohol it is drawing out many fibers, black particles and rarely seen, yellow gels.Things are kicking up. There is part of me that is calmly documenting this, and part of me that is asking myself, should I be freaked out? Should I stop the treatment? The answer I feel, is no. I am just trusting that this is bringing necessary issues to the surface and I'm sticking with it (although backing-off on the weekends, to go out and play). Gordon calmed my fears when I asked about all this activity, telling me this is part of the herxheimer. If the herx. becomes too much for me, I will back away till things calm down, but for now, the issues are minor and I'm soldiering on.Left: Lesion near elbow. 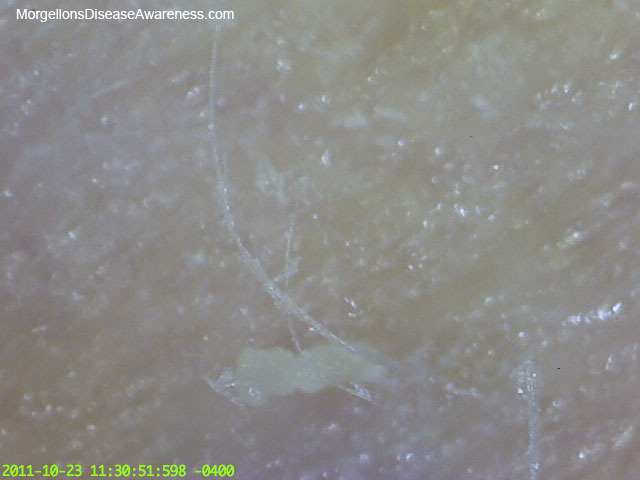 Below: Enlargement of elbow lesion.Above: Elbow lesion enlargement (200x).Above: Note the blue fibers clearly visible still under the surface of the skin.Above: Cotton ball soaked with alcohol drawn across the face shows much activity of fibers and black particles pulled from the skin. 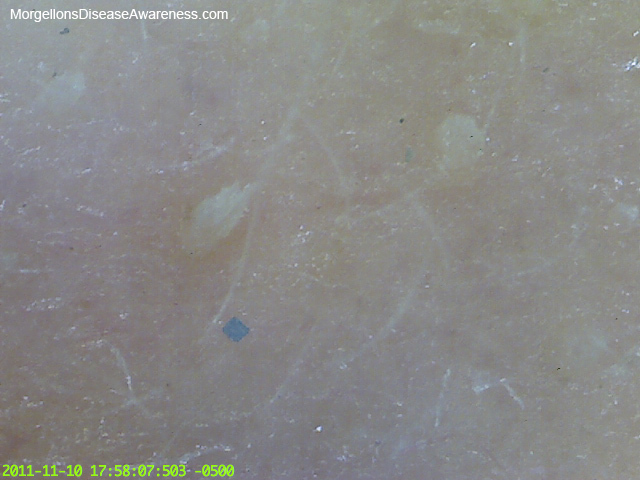 Additionally, and for the first time since onset of the disease, I'm seeing many yellow gels coming out.Above: Blue rectangle emerged on face. What's that? !Above: This track on the knee opened spontaneously after application of the F-6 two days ago. 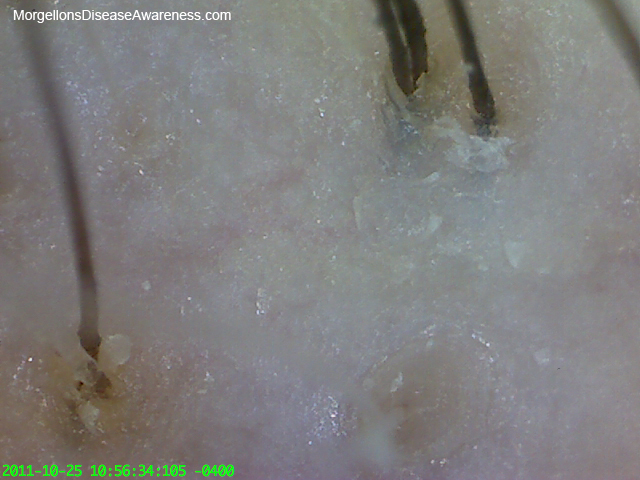 Literally, I looked down ten minutes after applying it and there it was.Above: Fiberball popped up while I was rubbing the F-6 into the skin. It was larger than a pinhead...the largest I've ever had come off me. Below: An enlargement of the blue section. 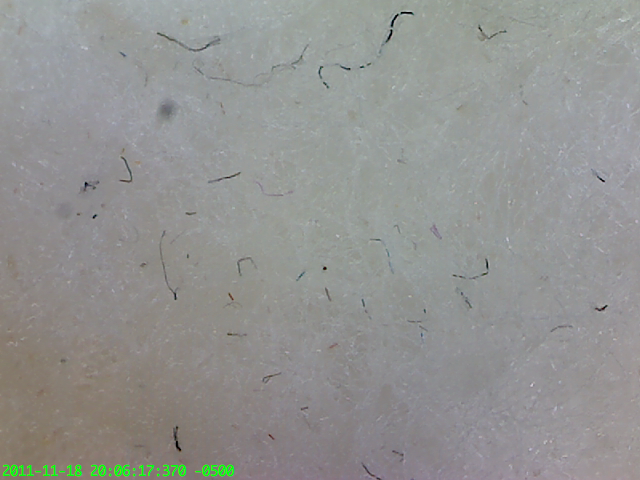 In general I notice a lot of fibers come to the surface after application of the F-6.Spoke to Gordon today. He assured me the F-6 was doing what it's supposed to. Increased fiber activity and black particles exiting the skin (as well as lesions) is part of the healing process. He said that over time I will see a decrease in this activity. I'm hoping that is the case.Above: There is intense fiber activity happening on the face. This photo was taken AFTER I had wiped the skin down with an alcohol soaked cotton ball (which removed A LOT of fibers), followed by a shower in which the face was washed. 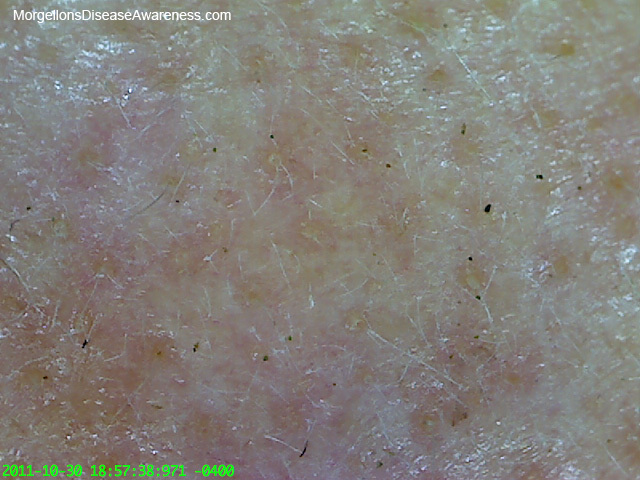 After seeing the fiber activity still on the skin in the above photo, I again cleaned the face with another alcohol soaked cotton ball and MORE fibers came out. 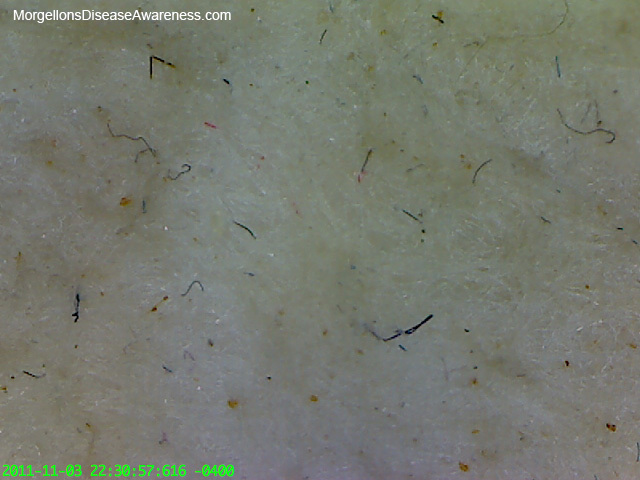 The photo below shows the fibers that were removed on the cottonball after 2nd cleaning.Nov. 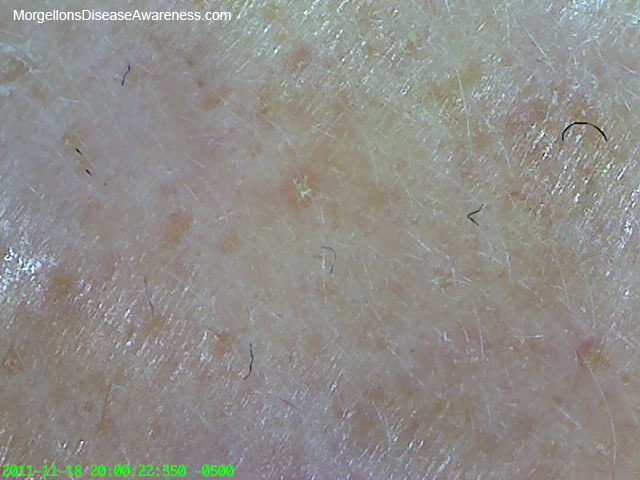 21, 2011 I'm seeing lots of fibers just under the surface of the skin (on the face). 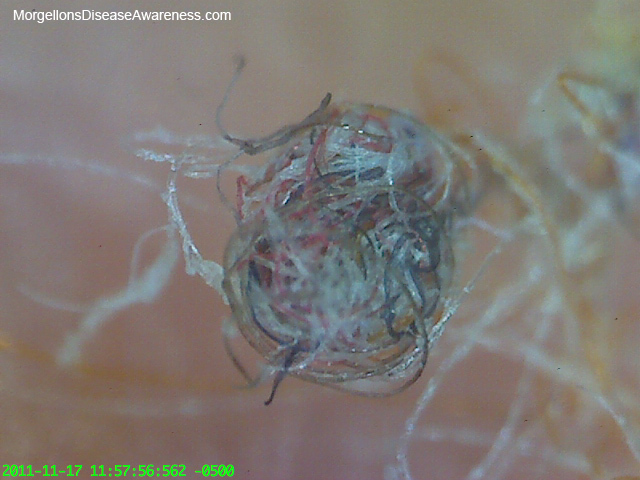 It is unusual to see this many fibers still under the skin. They are in the process of rising up to the surface. 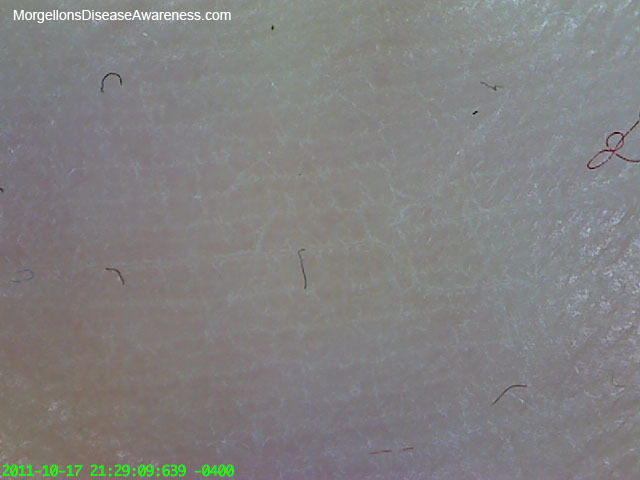 Also many black particles (all sizes) continue to exit.The only time I saw fibers rising up from the skin with this intensity was when I took Ivermectin (in the early stage of infection). 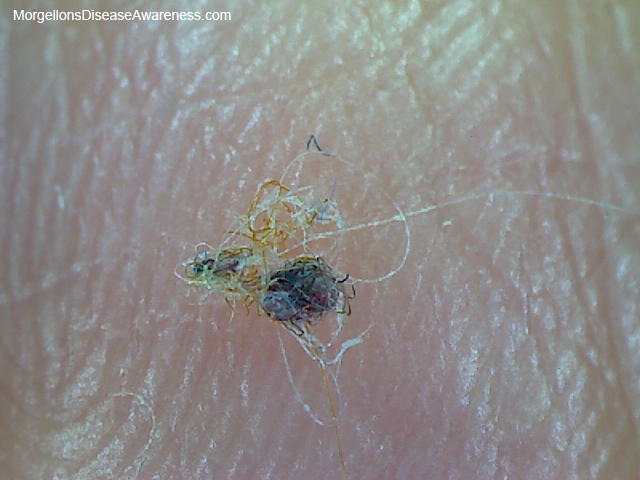 At the time I took the pharmaceutical, I knew I had Morgellons by the symptoms of biting, stinging, itching and crawling sensations on the skin, but I hadn't seen any fibers. 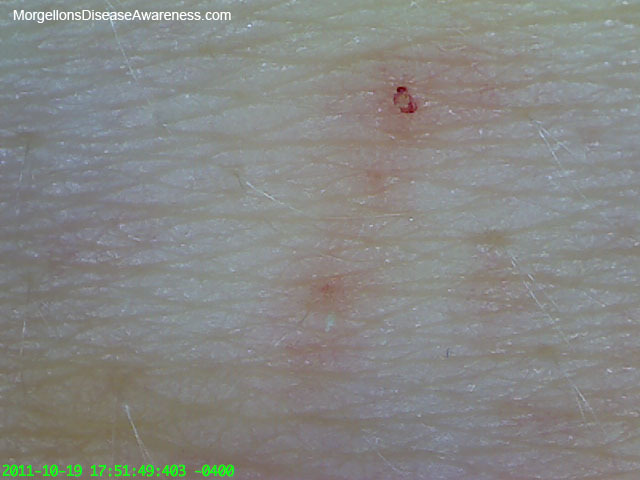 My skin at that time was heavily embedded with black particles everywhere I placed my microscope. Once I took the drug, fibers, like drowned bodies started rising up to the surface in an intense herxheimer.It makes sense then that what I'm seeing now is also a herxheimer reaction to the F-6 (only this time, I don't feel ill). 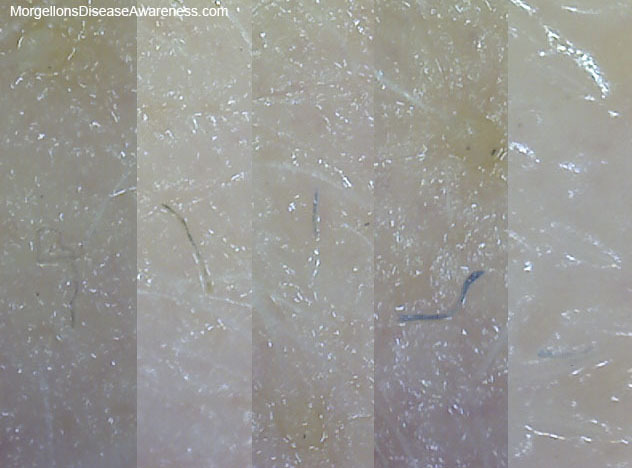 Above: Compilation of cropped images showing Morgellons fibers still under the skin rising towards the surface.Above: Light blue fiber under the skin. Particles of various sizes emerging.Above: Dust mote in my apartment. 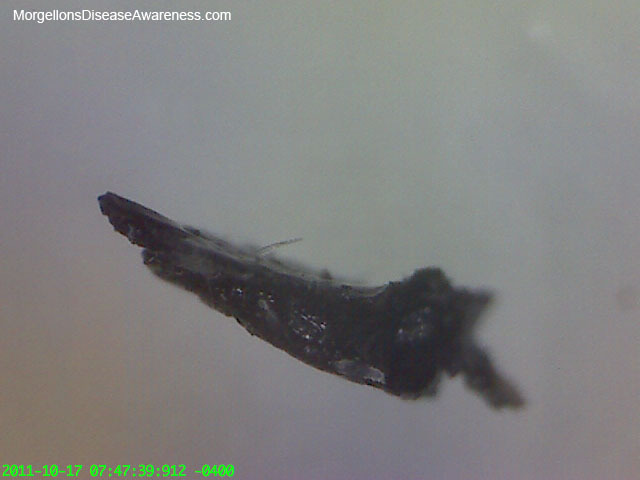 Look familiar?Above: Morgellons particles/debris found in my sheets. 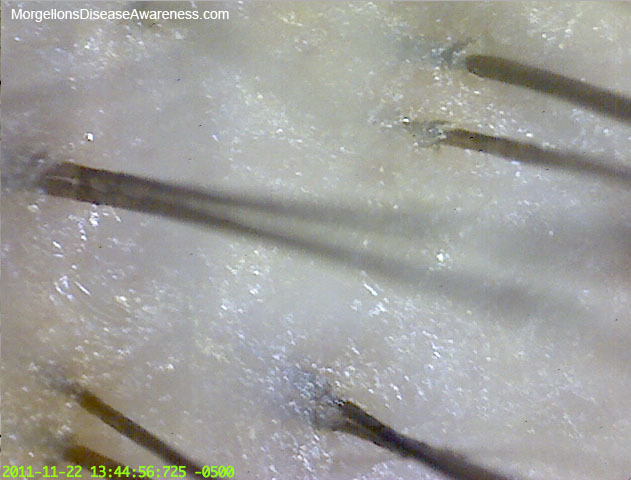 Above: Enlargement of particles in bedsheets.Above and 2 photos below: Nov. 22, 2011 Scalp follicles after almost a month of F-6 treatment appear to look less assaulted (compare images taken on Oct. 25 to see the difference). Skin on scalp is smoother. Hair has been feeling a little more elastic lately. 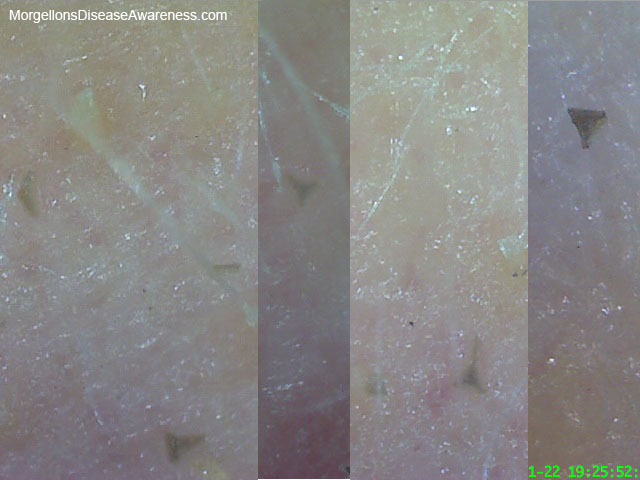 Not every follicle is out-of-the-woods yet, but a good improvement is noted.Group of 3 photos below: Nov. 22, 2011 Triangular particles are suddenly emerging from the face (and I caught one by the abdomen). These particulates were not there this morning when I checked the skin and hair! They emerged after a second spraying of F-6 on the face. Things are happening very quickly now.Above: Compilation of triangle particles as they start to rise through the skin. One can only wonder what they are.Dec. 5, 2011 Large particles continue coming up in hair. Below: Enlargements of the particles in the above photo. They seem very seaweedesque.Dec. 5, 2011 Took 1/8 tsp. of F-6 powder internally. Held it between lip and gums in mouth before swallowing. Will take it evey other day. If no problems, will increase dosage. Starting slow and carefully. Above: 'Glitter' artifact on the face. Perhaps it is a fiberball, but it definitely looked metallic before magnification. 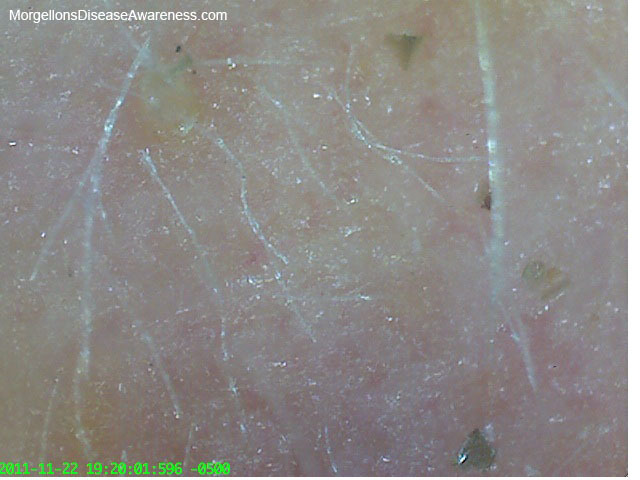 Many Morgellons sufferers say they see what looks like glitter on their skin.Above: Fiberball (held between fingers) that came up during application of F-6. Below: Enlargement of the same fiberball. 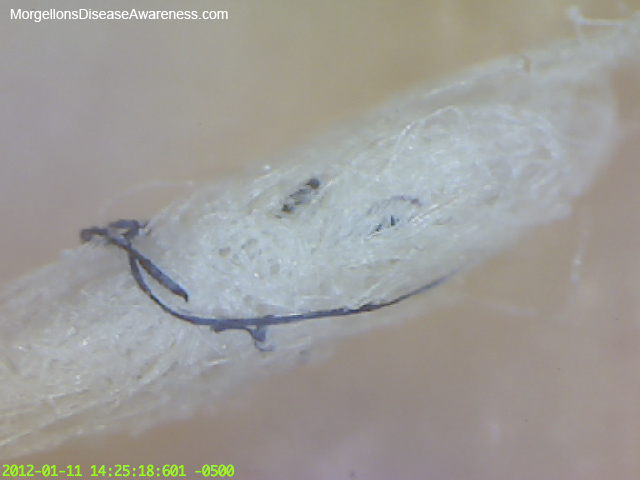 Note the almost perfect clear chain of fibers seen in the forefront of the photo. They are growing like a vine. Also, that red fiber in forefront is much thicker and flat than the other red fibers previously seen. 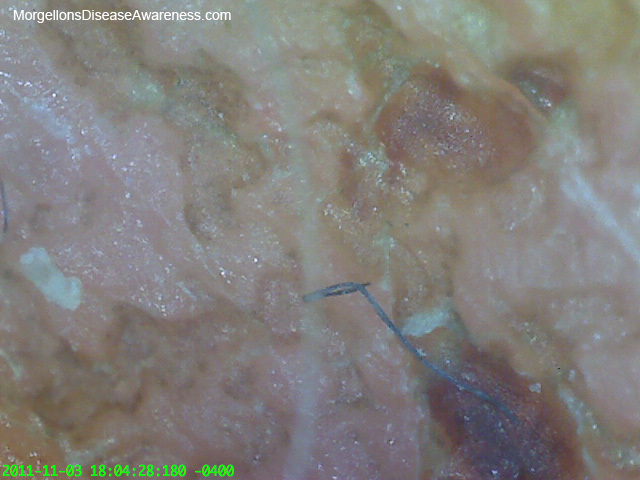 Not quite sure if that is a Morgellons fiber or not.Jan. 4, 2012 I stopped taking the F-6 internally after about a week. I'd bought an ozone generator and was working with it at the same time I was taking the F-6 internally. A lesion opened on my finger that was deep and oozing so I stopped taking the F-6 and the ozone. 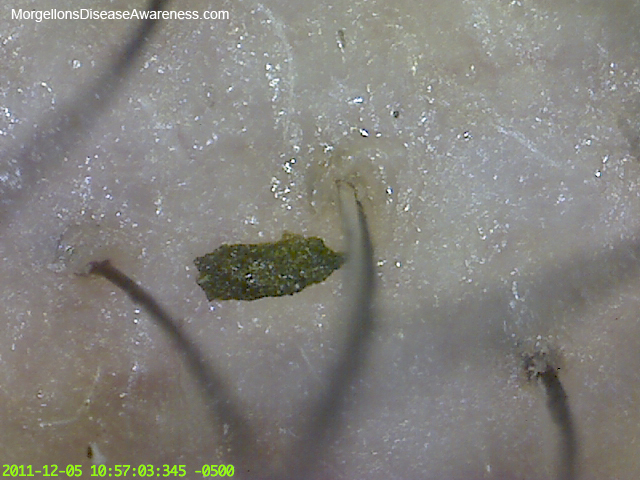 Someone emailed me that ozone could speed the growth of Morgellons up and cause lesions, so I am playing it safe and discontinuing both the ozone and internal F-6. I took the week off for Christmas and New Years and have just today gotten back into a cycle spraying the F-6 on skin again. So far nothing new is happening.Above: Rather large fiberball came off skin while rubbing the F-6 onto skin.Feb 8, 2012 Still spraying away. Not noticing any new changes although would like to note that I haven't been seeing for a few weeks now the tiny pinprick lesions that were coming up on my hands during the early months of treatment. Feb 15, 2012 Have just finished a week of ingesting F-6 internally again. 1/4 level tsp. every other day (placing the F-6 powder between the bottom teeth and the inside of the lip). Will continue like this for awhile, then increase dosage. I'm taking it slow with internal treatment as I want no sudden "issues" to pop up as some others have had. I've sat on the sidelines a good long while before beginning ingesting, having waited out the early herx. effects of small pinprick lesions opening on hands. Now that that has calmed down I'm ready to up the ante. March 20, 2012 Have been doing well. Was noticing that I was tired a few weeks back which could have correlated with beginning to take F-6 internally. That has all gone away. Very energetic these days. Will begin taking 1/4 tsp. every day. 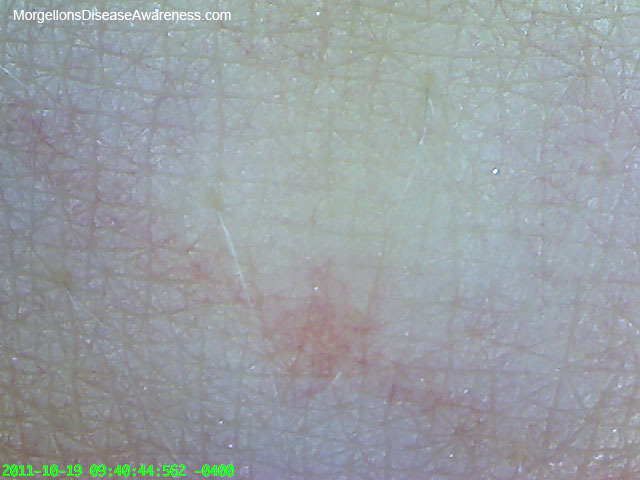 Seeing few black particles on my skin. The ones I do see look smaller. Noticing fiberballs coming up when I rub the F-6 into the skin after shower. Don't know what that means...if my body is producing more of them or they are being pushed out.May 16, 2012 I've stopped spraying the F-6 on the skin. Need a break from it, but still taking internally. A few weeks back started taking the 1/4 tsp. every day and now I'm starting to inch it up towards the 1/2 tsp. mark. Nothing new is happening. My system is very quiet. A good thing! I know there are people out there reading this journal to see what my experience has been and to evaluate the "F" products. From the contact I've had with others in the community, I would like to share that most people are really happy with what it's doing for them. Many are having vast improvements to the skin. I'm not saying these products will cure anything but they really seem to be helping. For those that are taking products internally, caution is advised. Too much too soon can bring issues to the surface and can bring on a herxheimer reaction. I prefer the dip my toe in the water method, moving slowly and minimizing any reactions the body might have. June 14, 2012 I have stopped the internal treatment as well. As I have no symptoms, and didn't notice anything new happening by taking the enzymes (plus some of them are duplicated in another enzyme formula I'm taking), I felt it unecessary to continue. I want to share the photos below. They are from a user that has made remarkable progress with Gordon's products. 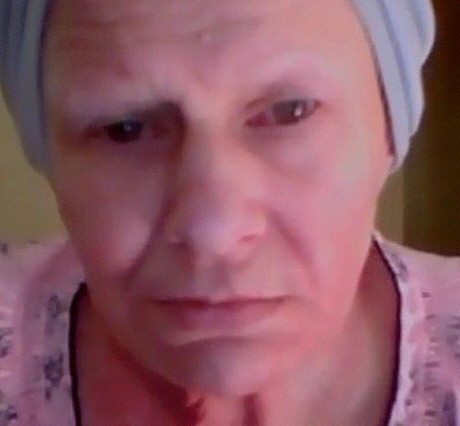 She shared that over the years of being ill with Morgellons the tip of her nose changed shape and became "calloused." As well, she felt that the bags and wrinkles that appeared were also some sort of biofilm buildup. She's been using the F products for some months now and has watched the skin clear as well as the biofilm in the built up areas break down. At times she has used an additional product, Monofoil, to switch off with as an adjunct therapy. Her skin today is looking much more smooth (and younger). The lesions have healed. 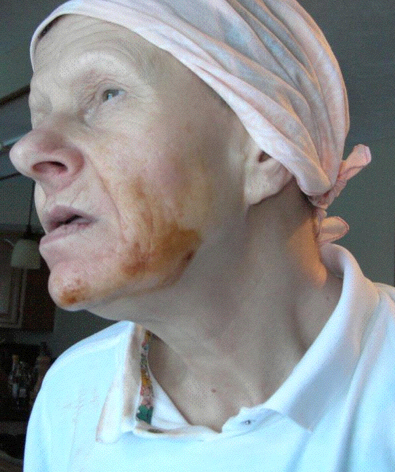 There are areas of her neck in which the skin is still sloughing off, but overall, she is thrilled by the help the products have afforded. There are others that have also shared their positive results using the "F" products with me. Please note: I've noticed that my spray bottle nozzle started cultivating a black mold internally over time. If you are applying the formula this way, I'd suggest mixing just enough of the "F" product to use in one treatment, then rinsing the bottle, refilling it with clean water and spraying a couple of times just to force the clear water through the device. This will keep it free from debris.Below: "Before" photoBelow: "After" photos. She has some makeup on, but still, one can see the skin well enough to see the improvement. 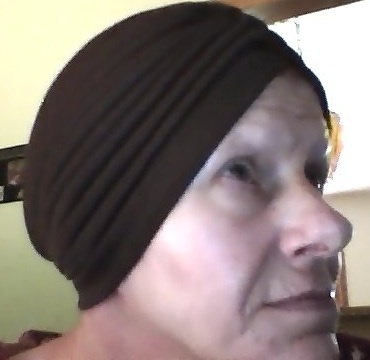 July 2012Below: Shot with brown turban taken June, 2012. The one below it also taken in 2012. The information contained herein is for educational purposes only, and is not intended to diagnose, treat or cure any disease or illness. MorgellonsDiseaseAwareness or its administrators are not responsible for your use of any of the products mentioned or information given.The information provided herein is not intended to provide medical advice. Persons with known medical conditions should consult a competent professional. Please note that Gordon Stamp is no longer producing the F line and unfortunately for Morgellons sufferers and Gordon, the FDA is investigating his product. I'm leaving this page up in case people are interested in my experience with it. 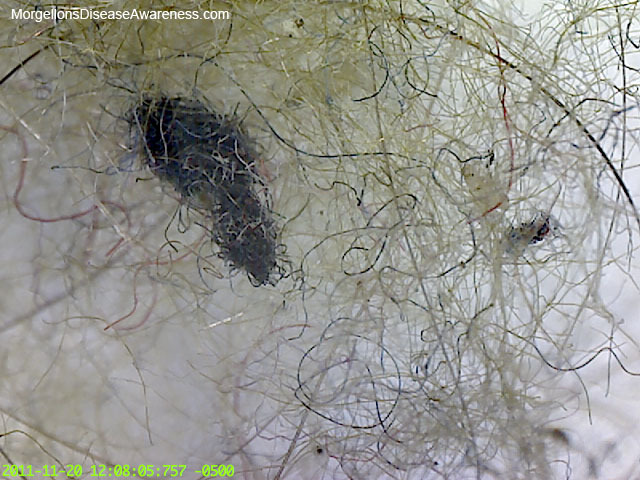 The Morgellons community stands behind Gordon for trying to help us in an hour of need—something the medical community has failed miserably to do. His dedication and determination to turn things around for himself, his family, and those who have been afflicted has been truly heartfelt. If you can lend some financial support for his legal fees, it would be greatly be appreciated. Gordon Stamp, a fellow Morgellons sufferer unable to get relief by traditional means set out to study Morgellons. Five years later, he has formulated a product called F-6 Restore that seems to be helping people. It's an organic enzyme product applied directly to the skin. I'm documenting my experience with it here. Please note: at the time I created this diary Gordon was sellling F-6. Over time he has adjusted the formula and so his newer products have a different name. It might be best if you are considering ordering some, to give him a call and discuss what might be best for you. I do not recieve compensation for reviewing or linking Gordon's product. Oct. 16, 2011 Product arrived today. Powder needs to be added to water. Small convenient spray bottle was enclosed with it. I've tested it on small patches of the body to see how I react. Almost imperceptible burn sensation. Within seconds of rubbing the wet solution into the skin I could feel particles in a few areas sloughing off under my fingers. 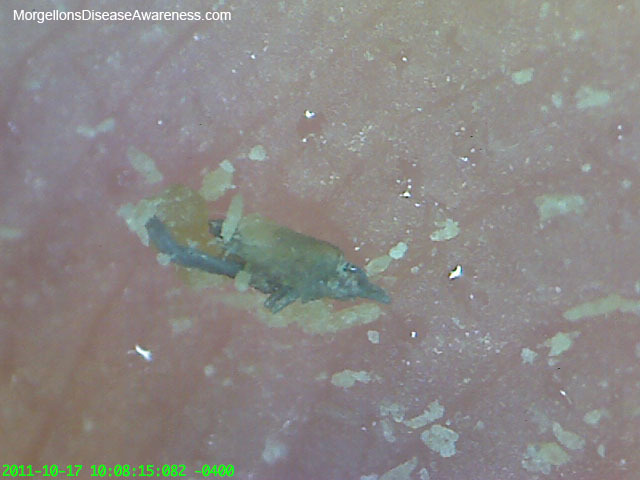 I have no idea what this is coming off the skin, but am encouraged to see fibers and tiny black particles being taken with it. Above: Two cylindrical forms balled up after rubbing the skin with product. Below: Enlargement of cylindrical form with fiber and black particle. Above and below: This rock-like particle (as large as a pinhead) emerged from the skin. Haven't seen one of these since early onset of the disease. 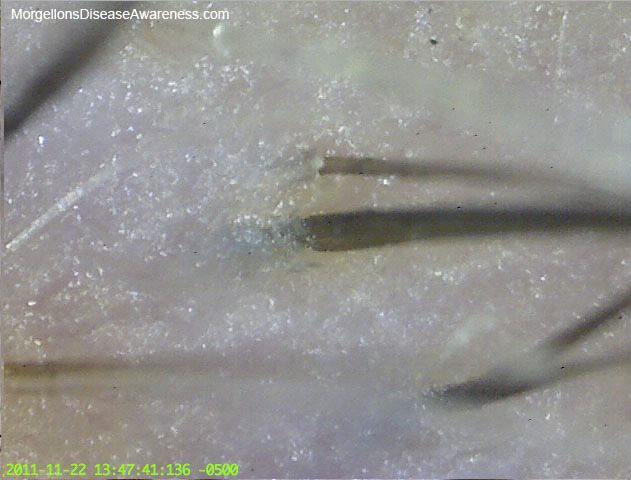 Many Morgellons sufferers have felt what seems like fiberglass cutting into their skin. You can see from these pictures how much these particles resemble glass. 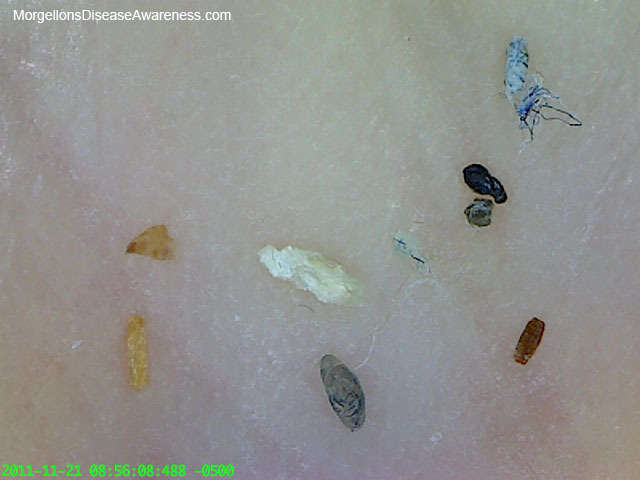 It is understandable that the presence of these particles under the skin would cause great discomfort. Above: I'm growing dolphins! 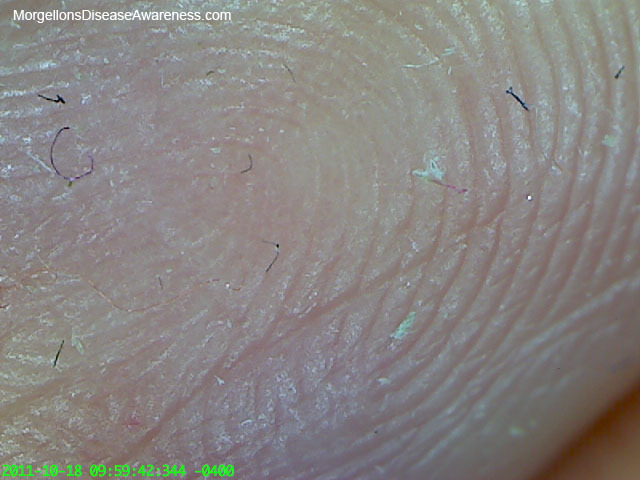 I've been expanding the use of F-6 rubbing it over larger tracks of my body, I happened to take a look at my fingers with the scope (two photos below) and was surprised to see this many fibers at one time. I've noticed since the onset of disease that fibers seem to concentrate in the hands but I've never seen quite this much activity. It appears that the F-6 is pulling them to the surface. Fibers have not appeared in all the areas sprayed with the product, but certain spots like my abdomen, are definitely "sprouting." for now, the issues are minor and I'm soldiering on. Below: Enlargement of elbow lesion. Still spraying away. Not noticing any new changes although would like to note that I haven't been seeing for a few weeks now the tiny pinprick lesions that were coming up on my hands during the early months of treatment. Feb 15, 2012 Have just finished a week of ingesting F-6 internally again. 1/4 level tsp. every other day (placing the F-6 powder between the bottom teeth and the inside of the lip). Will continue like this for awhile, then increase dosage. I'm taking it slow with internal treatment as I want no sudden "issues" to pop up as some others have had. I've sat on the sidelines a good long while before beginning ingesting, having waited out the early herx. effects of small pinprick lesions opening on hands. Now that that has calmed down I'm ready to up the ante. March 20, 2012 Have been doing well. Was noticing that I was tired a few weeks back which could have correlated with beginning to take F-6 internally. That has all gone away. Very energetic these days. Will begin taking 1/4 tsp. every day. Seeing few black particles on my skin. The ones I do see look smaller. Noticing fiberballs coming up when I rub the F-6 into the skin after shower. Don't know what that means...if my body is producing more of them or they are being pushed out.May 16, 2012 I've stopped spraying the F-6 on the skin. Need a break from it, but still taking internally. A few weeks back started taking the 1/4 tsp. every day and now I'm starting to inch it up towards the 1/2 tsp. mark. Nothing new is happening. My system is very quiet. A good thing! I know there are people out there reading this journal to see what my experience has been and to evaluate the "F" products. From the contact I've had with others in the community, I would like to share that most people are really happy with what it's doing for them. Many are having vast improvements to the skin. I'm not saying these products will cure anything but they really seem to be helping. For those that are taking products internally, caution is advised. Too much too soon can bring issues to the surface and can bring on a herxheimer reaction. I prefer the dip my toe in the water method, moving slowly and minimizing any reactions the body might have. June 14, 2012 I have stopped the internal treatment as well. As I have no symptoms, and didn't notice anything new happening by taking the enzymes (plus some of them are duplicated in another enzyme formula I'm taking), I felt it unecessary to continue. I want to share the photos below. They are from a user that has made remarkable progress with Gordon's products. 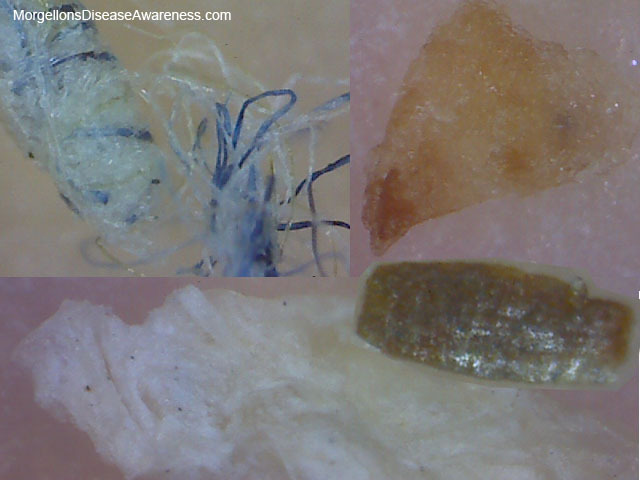 She shared that over the years of being ill with Morgellons the tip of her nose changed shape and became "calloused." As well, she felt that the bags and wrinkles that appeared were also some sort of biofilm buildup. She's been using the F products for some months now and has watched the skin clear as well as the biofilm in the built up areas break down. At times she has used an additional product, Monofoil, to switch off with as an adjunct therapy. Her skin today is looking much more smooth (and younger). The lesions have healed. 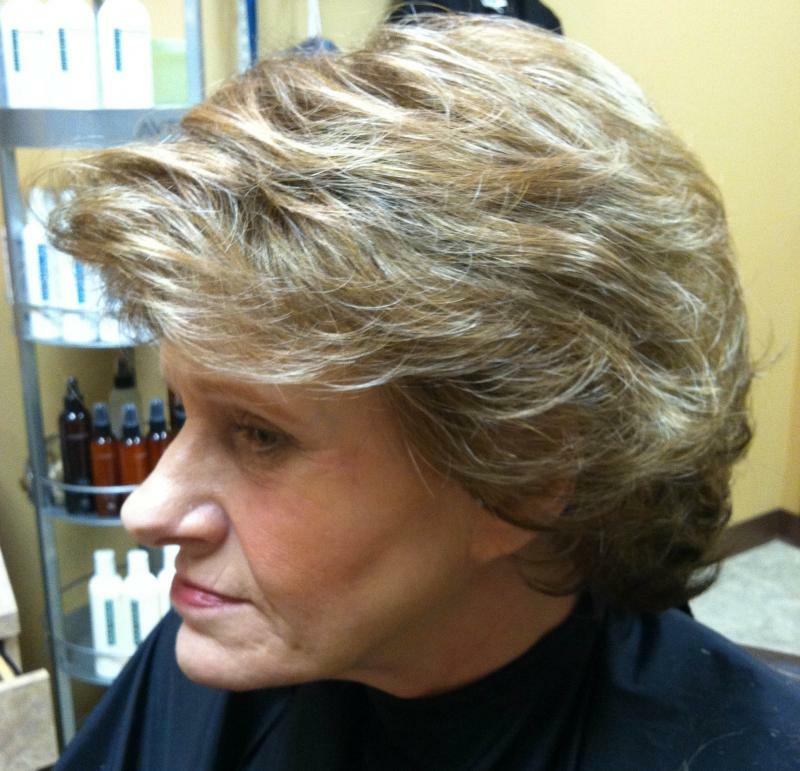 There are areas of her neck in which the skin is still sloughing off, but overall, she is thrilled by the help the products have afforded. There are others that have also shared their positive results using the "F" products with me. Please note: I've noticed that my spray bottle nozzle started cultivating a black mold internally over time. If you are applying the formula this way, I'd suggest mixing just enough of the "F" product to use in one treatment, then rinsing the bottle, refilling it with clean water and spraying a couple of times just to force the clear water through the device. This will keep it free from debris. Below: "After" photos. She has some makeup on, but still, one can see the skin well enough to see the improvement. July 2012 Below: Shot with brown turban taken June, 2012. The one below it also taken in 2012. The information contained herein is for educational purposes only, and is not intended to diagnose, treat or cure any disease or illness. MorgellonsDiseaseAwareness or its administrators are not responsible for your use of any of the products mentioned or information given.The information provided herein is not intended to provide medical advice. Persons with known medical conditions should consult a competent professional.